Although the farm where we pick blueberries is only a few miles away, it feels like a world away. Even the drive is relaxing. Just off HWY 18 near Auburn, the two lane road weaves through old farm homes and fields bursting with various fruits and vegetables. We approach Canter Berry Farms and park in front of a large barn that was built in 1874. The grounds are dotted with all types of flowers. Reba the St. Bernard greets the kids before one of the helpful owners hands us picking buckets and leads us back to the area where we’ll be picking. The surroundings are peaceful. The only sounds are my kids shoving blueberries into their mouths as fast as they can pluck them. That’s one of the benefits of picking at Canter Berry: you’re free to eat while you pick. Which is good because if they weighed Lincoln before and after the picking I’m sure we’d be on the hook for another twenty bucks. Kim, Luca and I picked for about 90 minutes. Lincoln and Anna ate what they picked, but we still ended up with just over 18 lbs of blueberries. 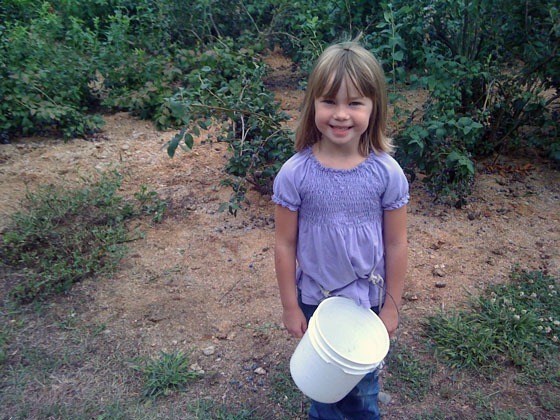 That’s Luca above filling her bucket with berries. She’ll follow Kim or me around knowing she can reach the lower branches easier than we can. Kim has been taking the kids for the past three years. Today was the first time I’ve gone with them, and I am kicking myself for not tagging along sooner. The wind was light but the air was cool for an August afternoon. We saw people from all walks of life in the fields picking berries. What a wonderful activity for the family. We’ll freeze a number of bags worth because they made such a good snack frozen. Maybe Kim will make jam from the rest. If we can keep the kids from sneaking handfuls when we’re not looking. That sounds like us picking blackberries the other day. I love that drive! Have you guys been to Flaming Geyser State Park, just a little further down the road? The geyser is not impresive but I loved the little hike we went on with the cubs a few years ago. So beautiful. You just inspired me to check out the berry picking schedule for the local farm near me. I haven't been since I was a child, and we only went for apple picking. I haven't been back since I can't imagine what I would do with all of those apples. Berries, on the other hand, are so much smaller and freeze well. Sounds like a great outing for families or with a group of grown friends.